Cow are an enviormental hazard??? Sounds strange, I know. Especially since we have been led to believe that the evils of the world wreaking havoc with the environment are: the big factories, the huge mining projects, the oil in the ocean, the fumes from cars, etc. etc. etc. We are now discovering that in actuality this is a hoax: it is cows -- yes, cows! -- that are truly destroying the ozone layer and consuming our waters. They are the number-one cause of world starvation. According to some new discoveries, such as those presented in the documentary "Cowspiracy," cows are the number-one cause of all of the environmental problems we are facing today, all across the globe. In the meat and dairy industries, huge herds of cows are maintained in order to meet the demand for these products. This exerts a huge cost to our planet Earth and to mankind. Cow flatulence releases methane into the atmosphere, which causes global warming. Cows consume huge amounts of water. The same amount of food required to feed one cow alone could, instead, feed many starving people. Cows are indirectly the leading cause of deforestation. These are only some of the negative effects of the meat and dairy industries; you can learn more on the movie's website. While I am confident that those who seek to raise our awareness of these facts mean to show people the hazards of meat and dairy consumption and promote veganism, they are actually missing the point. People do not need to consume meat to be healthy. This is a fact. The huge meat and dairy industries comprise a massive environmental hazard. That is also a fact. Cows should not be seen as a commodity to be consumed. That is an ethical stance more people should take. 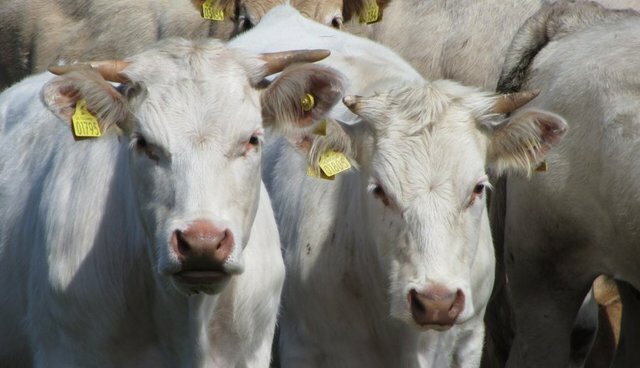 What is left out is that there is an approach to raising cattle in a way that is both beneficial for the animal, for humans, and even more so for society at large. The Vedic scriptures teach us that the consumption of milk is important for the development of the brain's finer tissue and for the ability to understand spiritual and philosophical topics. At the same time, the Vedic scriptures also teach us non-violence and the need to protect all living entities from harm. What this basically means is that there is no harm in consuming dairy products, but, rather, that harm comes into play when cows are bred in huge numbers, abused, tortured, and killed, all for for the sake of satisfying the human palate. Milk can be obtained from the cow with great care and love, without harming her or her offspring in any way. Cows are not to be bred in huge quantities simply to ensure the ongoing creation of milk and the supply of meat. Cow are never to be slaughtered -- not them, and not their male offspring. Cows are to be protected, loved, cared for, and cherished.